Imagine for a second how it would be to have a relationship that you truly enjoy and doesn’t just feel good for the moment, but it just keeps growing. Understand not only why your partner does what they do, but also why you yourself do what you do (and what to do about it). Discover surprisingly simple things that you can start doing today to reconnect and finally feel loved, wanted, and desired again. Learn the five magic questions to ask you partner so you’ll always know what's really going on and the question you must stop asking right now. Discover how to approach your loved one so they’ll open up and be drawn to listen to you even if they’re currently pulling away. Learn what to do when you get criticized, and how to react when emotions run hot (even if you did nothing wrong). Discover how to finally make peace with the past and safely express your deepest needs, desires, and frustrations with heartfelt honesty without upsetting your partner. Last but not least: when you get this book, at the end of each session, you’ll get instant access to your secret bonus section with exclusive cheat sheets and worksheets for faster results. 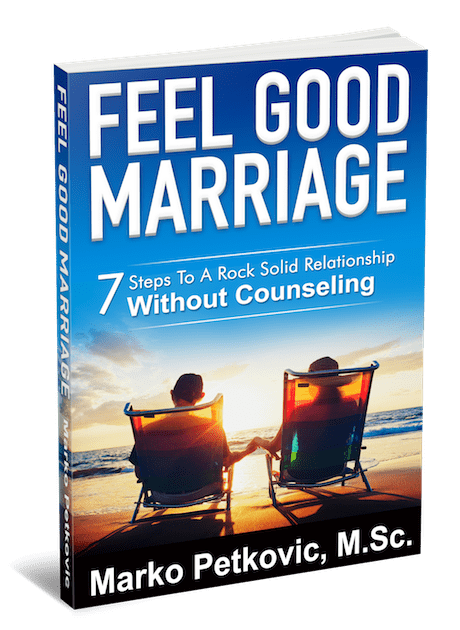 Feel Good Marriage is a simple straightforward approach to healing your marriage. Unlike other books Marko Petkovic teaches you how to begin with what's most important: how you think about and see your partner. This one focus has opened up my eyes to all of my relationships and even as a mental health counselor, has shifting my thinking. Having been a counselor for over 30 years, I can tell you the information he gives you in this easy to read book is a gem. I have suggested to many of my clients to read this book. I would be delighted if they transitioned into a “Feel Good Marriage” and no longer sought counseling. My wife and I have been married for almost 17 years and are madly in love. I’ve finally figured out, though, that if I'm not actively working to improve our relationship, it could easily get stagnant. From a guy's perspective, I felt like Marko Petkovic was reading my mind because he hit on so many points I needed to work on, like your "relationship GPS," the "poison pills," and how to receive criticism. I liked that he had questions and action items in each chapter (I kind of need that step-by-step stuff). Even if your marriage is in pretty good shape, you should probably read this. To get someone to realize, not just why their partner does what they do, but why THEY themselves do what they do, I think, is huge. People are always trying to understand the other, when so often they need to understand their own motives first. I think Feel Good Marriage is a really good book. Marko's book is unique in the landscape of relationship improvement self-help books. While it provides many practical suggestions as to how to significantly improve your marriage, it also provides the insight to motivate you to do so. For example, his explanation of how we fall in love and why those feelings never last was eye-opening and will prevent readers from wasting their time in searching for a "flawless mate". Marko's book profoundly changed the way that I think about my relationship with my husband. I consider myself extremely fortunate that I read this book. This is one of just a handful of books that I read twice. It also helps to identify those nasty little poisonous things that would sneak into a marital everyday and where one would just not react due to lack of time or energy or merely dismissing it as not important. Marko shows how these small ignored steps can lead to a major sidestep and what to do about it. I would recommend the book to every person who wants to improve their relationship or set solid foundations for a new love. There are lots of "OK" books out there about and making your relationship work, but I've found many of them devoid of any personality, or any level of empathy. “Feel Good Marriage" is clearly written by someone who has been there, and understands how it feels to be in a stormy relationship. It's easy to follow, entertaining, and the advice given is genuinely actionable. Anyone who wants to improve their relationship or regain the “spark” will be able to make great strides after reading this book. 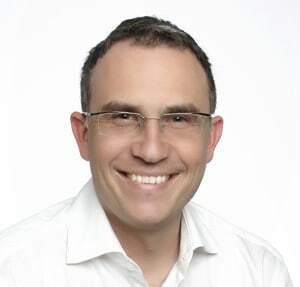 Marko Petkovic is a best-selling author, publisher and creator of feelgoodrituals.com, dedicated to helping people achieve healthy, fulfilling relationships, personal success and abundance.